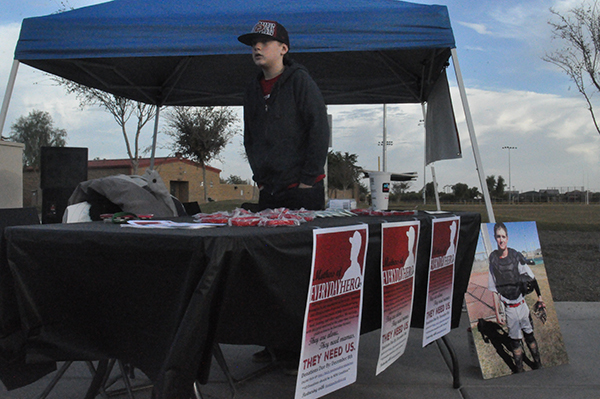 Turning tragedy into hope, a new group in Maricopa is finding ways to embrace the city’s homeless teens. The newly formed Mothers of Everyday Heroes organization has begun collecting clothing and other necessities for hundreds of youth in Maricopa. It was inspired by one truly unique teenager. In late August, Jennifer and Doug Ford lost their 16-year-old son Nate in a traffic accident. Nate’s passing created an outpouring of support of the Ford family, and stories of Nate’s selfless nature quickly spread around town. One such story revealed Nate, who mostly wore cowboy boots, always kept a pair of athletic shoes he never wore in his truck. After the accident investigation, Nate’s belongings were returned to the family. Among the belongings, the Ford family noticed the extra pair of shoes. As it turns out, Nate kept the shoes in case any of his teammates needed a pair for the day. It wasn’t long after the accident that Jennifer Ford received an explanation of why her son felt the need to carry around the shoes. During a meeting with Maricopa Police Chief Steve Stahl, Ford learned hundreds of youth in Maricopa are either homeless or don’t have a proper support system to supply them with what they need. Ford then reached out to Maricopa High School to confirm the number, and Dean of Students Brian Ewing said 411 district students are homeless. Ewing said if you wait at Pacana Park until the lights go out, you will see families set up for the night. Ford decided something had to be done. She spoke to one of her friends about collecting donations for Maricopa’s homeless kids. Quickly, the participation grew from the duo to six moms. The group of six hit the ground running and recruited 30 more members to the project. From there, it spread like wildfire. Those 30 moms went looking for five more members each. Before Ford knew it, her new “Mothers of Everyday Heroes” program had spread across the country and found its way to Canada and Japan. Ewing’s wife Yolanda is CEO of Families First CDC, which is a partner in the Mothers of Everyday Heroes effort. Brian Ewing said they want to see much of the help for the local teens come from Maricopa rather than Casa Grande or Phoenix. The afterschool program teaches life skills and etiquette and helps struggling teens prepare for college if that is their interest. Families First also has an annual prom dress drive. Mothers of Everyday Heroes is aiming to gather 150 care packages for the youth in need within the community. 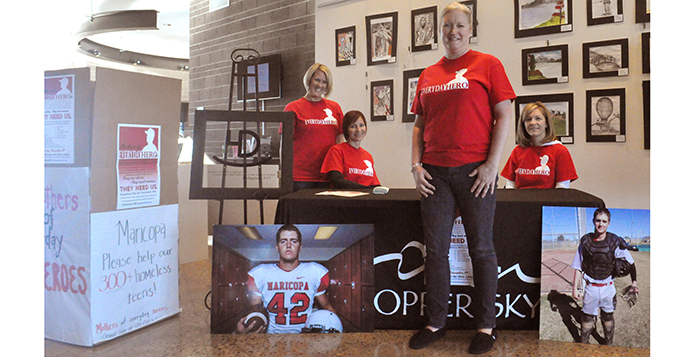 Now through Dec. 8, a donation center is set up in the Copper Sky Multigenerational Center lobby. For a list of needed items, go to the organization’s sign-up page. Helping with community events is something the staff at Copper Sky takes seriously. In this case, Nate Ford spent summers helping with camps and refereeing soccer games at Copper Sky. The staff had a personal connection with the Ford family and knew it was simply the right thing to do. On Dec. 8, the “Mothers of Everyday Heroes” will gather all of the donations at Copper Sky and bring them to the Ford house to separate into care packages and disperse them to the youth in need.